TOKAI GLOBAL GREENING Co., Ltd.
in the earth with all of you. Tokai Global Greening Company (TGG) hopes to plant many trees together with the peoples of foreign countries in order to save the global environment. In recent decades forests have disappeared in many parts of the world, in particular from African, Southeast Asian, and South American countries. The main reasons are that they have been razed to obtain lumber, pulp for paper making, and firewood, as well as having been destroyed for slash-and-burn agriculture. These destructive factors originate from unbridled human activities. Environmental issues, such as global warming, have become major problems. Large-scale floods and droughts, unusual weather, and other abnormalities are occurring more and more frequently throughout the world. These destructive abnormalities have been shown to be caused by global warming. Forests have very important functions: the absorption of carbon dioxide from the air, prevention of topsoil erosion and flooding, and protection of wild animals, insects, and human beings. 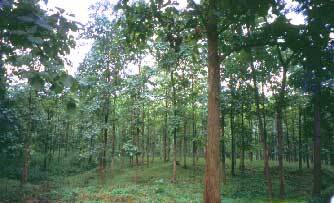 Regeneration of forests lost due to human activities therefore is an urgent task. TGG has begun planting teak saplings in Thailand. They are produced by a novel method that we developed. We ask your cooperation so that many more trees can be planted in aid of reforestation. Planting even one tree with your help is an important step in saving the earth for this and future generations. To ensure a bright future for our earth won't you help us plant trees? All information of this webpage cannot be reproduced or transmitted in any electronic copying, recording without the permission of Tokai Global Greening Co., Ltd. Copyright 2003 Tokai Global Greening Co., Ltd.